Henrietta Maria, the youngest child of Henri IV of France, was born in 1609. After the assassination of her father in 1610 Henrietta Maria was brought up by her mother, Marie de Medicis. In 1625 she married Charles I. As she was a Roman Catholic, this marriage was not very popular with the English people. The Puritans were particularly unhappy when they heard that the king had promised that Henrietta Maria would be allowed to practise her religion freely and would have the responsibility for the upbringing of their children until they reached the age of thirteen. The couple had six children, Charles (1630-1685), Mary (1631-1660), James (1633-1701), Elizabeth (1635-1680), Henry (1640-1660) and Henrietta (1644-1670). Sophia of Bavaria met Henrietta Maria in 1641. She later recalled: "I was surprised to find that the Queen, who looked so fine in the Van Dyck painting, was a small woman... with long skinny arms and teeth like defence works projecting from her mouth." In 1642 Henrietta Maria fled to Holland where she raised funds for the Royalist army. 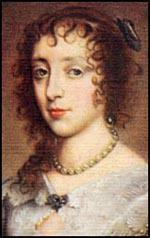 She wrote to Charles I on 23rd February, 1643: "All day we unloaded our ammunition... The cannon balls whistled over me; and as you can imagine I did not like the music... I went on foot some distance from the village, and got shelter in a ditch. But before I could reach it the balls sang merrily over our heads and a sergeant was killed twenty paces from me. Under this shelter we remained two hours, the bullets flying over us, and sometimes covering us with earth... by land and sea I have been in some danger, but God has preserved me." She returned briefly in 1644 but left for France when it became clear that the Parliamentary army was winning the Civil War. Henrietta Maria visited England twice during the reign of her son, Charles II. Henrietta Maria died in 1669. (1) Sophia of Bavaria met Henrietta Maria for the first time in 1641. Later she wrote a letter to a friend about the Queen. I was surprised to find that the Queen, who looked so fine in the Van Dyck painting, was a small woman... with long skinny arms and teeth like defence works projecting from her mouth. (2) During the Civil War Henrietta Maria went to Holland to raise funds for the royalist army. On her journey back her ship was chased by four Parliamentary ships. 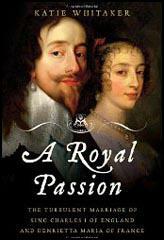 On 23 February, 1643, she wrote a letter to Charles I about her experiences. All day we unloaded our ammunition... The cannon balls whistled over me; and as you can imagine I did not like the music... I went on foot some distance from the village, and got shelter in a ditch. But before I could reach it the balls sang merrily over our heads and a sergeant was killed twenty paces from me. Under this shelter we remained two hours, the bullets flying over us, and sometimes covering us with earth... by land and sea I have been in some danger, but God has preserved me.